MySpace IM Password Recovery - instantly find and decrypt your MySpace password! Password Recovery for MySpaceIM allows you to see saved MySpace password if you forgot it. It is easy to check whether your MySpace passwort can be extracted from MySpaceIM. MySpace password can be found only if you can login into MySpaceIM without having to enter your MySpace password. You can now use our tool tool called Password recovery for MySpaceIM to reveal the passwords. This section explains how to get MySpaceIM passwords hidden with asterisks in your MySpace instant messaging client. You can now go to MySpace website and change MySpace password to something you can remember (but not too simple for the hacker to guess!). 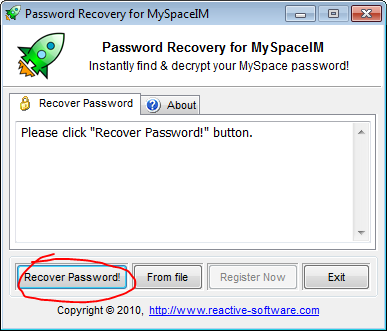 Password Recovery for MySpaceIM is able to recover MySpaceIM usernames and passwords from external user data files. Note: you will only be able to recover the password if the data file has been created under the same Windows account on the same computer. Recovery of passwords from data files transferred from other computers or user accounts is not possible. This is because the passwords are encrypted using CryptUnprotectData function that makes the encrypted password unique to the user account and computer. 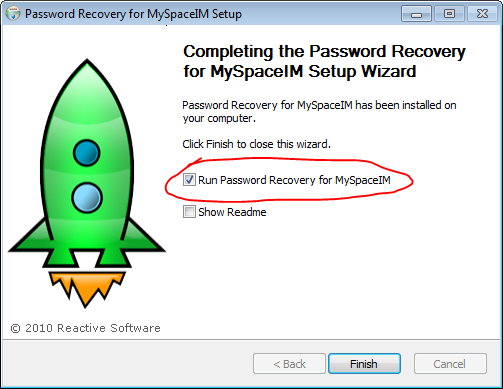 Once you have copied the data file to your system, run Password Recovery for MySpaceIM and click on the From File button. Select your copied users.txt file and click OK. All passwords saved in that data file will be recovered and shown on the screen. We test our products thoroughly on different environments and with different versions of software to deliver the highest possible quality to our customers. Your satisfaction is guaranteed!